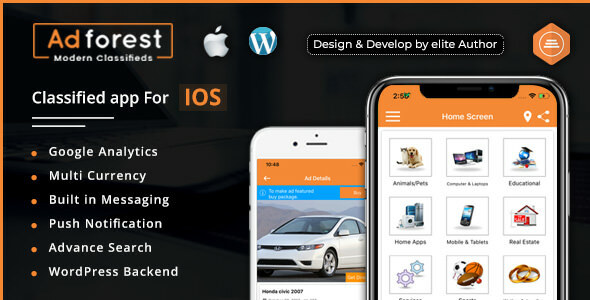 Adforest IOS Classified ads app is most awaited and modern classified ads app for IOS, developed to help grow your classified business. With our IOS mobile classifieds app you can manage product listing for your ad posting website. It is the best classified app comes up with awesome handy features including Multi-Currency front end, Radius search, Bad Word Filter, AD Expiry Limits, Ad Status, Google map integration, Location or Price base search plus user can contact seller/buyer with massaging system, push notification, Admob, Google analytics and many more outstanding features that most of the mobile classifieds app doesn’t support.